I asked and you responded. If you sent me your problems, I’d try and give you better (or at least equal) advice than your mother. All with a straightforward style and a touch of humor. If you’re wondering the inspiration. It’s my own mother who gave me the best personal and career advice. I wanted to carry it forward. So much of what she shared with me is as relevant as ever. Plus just like Carrie Bradshaw, I’ve got a column (but with Women@Forbes) and I thought it was time to give so many of my readers a chance to reach out and anonymously share whatever was on their mind because I’ve been getting a lot of questions (you’ve been dm’ing me) lately. So let’s try and solve one and then maybe a few more over the coming months. One last thing. Don’t worry. We won’t tell…all submissions are anonymous. One Problem: I have to do a presentation to a group of 50 people in two weeks and I am a very nervous public speaker. Other than practicing like crazy so that I know my content, what can I do to appear more comfortable in front of the crowd? One Solution: Who doesn’t get nervous? I remember one of my very first presentations in my career. As much as I rehearsed I couldn’t calm myself. You know. The stomach. The flip-flops. The fear of failure. Looking at the audience (and trying to imagine everyone in their underwear is the oldest cliche that doesn’t work and who gave that stupid advice to begin with?) and blanking. First, yes rehearse. Make sure you know your key points and the details but you need some structure and systems to help get you though your presentation. Here’s a few things no one every tells you but maybe me. Hold something in your hand. This may sound stupid but it works. It’s a secret security blanket. Grab anything from a pen, pencil, small paperclip to a tiny crystal and hold it in your hand. It gives you strength and you don’t feel alone. Try it. I’m not kidding. It works because it grounds you. Arrive early and adjust your surroundings. This is one of my personal tricks. I arrive early (and I occasionally do) so I can secretly adjust my surroundings and get set up the way I like it. The emphasis is on me. Don’t apologize. YOU need to be comfortable. I try and make sure there is a podium, maybe a chair to sit in (I love a fireside business chat format and a moderator for support). If all that is in place, hold on to the podium or a chair for dear life. This is a great trick for newbie speakers. It gives you stability. If not, it’s back to the pencil and paper clip.The moral of this tiny tale is: the more comfortable you are before you start the easier it is. Use a system to look at the audience. Dong. Watch some great speakers, especially late night TV hosts, and they look at their audience but move their glance from the center, to the right, to the left (or vice versa). Once you start doing that it becomes simple. Translation an easy, easy habit and ding, you know where to look. You’ve got a system. You’re so busy with your systems you haven’t got time to be nervous. Look center. Look left. Look right. Meet and Greet. 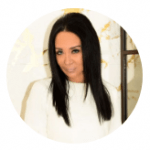 Demystifying your audience before your presentation even starts. Meet them. Go out and actually greet them before you start. Now there’s an epiphany. If you know who you are speaking to in advance then it all seems so much more personal. Note to self. If you have a supportive colleague in the audience (and try and muster one), look at them for the occasional positive response. The Other Stuff. There’s a few other things you can try but if you haven’t heard of Dale Carnegie and his books and speaking classes, they are as old school and still as relevant as ever. They’re way, way, way before my time but that’s how universal his advice is. 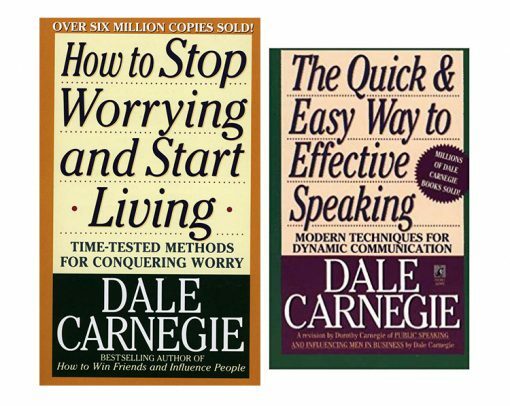 Carnegie’s books and courses help you unlock your speaking potential. I read every book of his (in my teens) and personally carried with me every single day How To Stop Worrying and Start Living for years. I am a world class worrier. Don’t let my fashion savvy fool you. When I got nervous (and I used to be painfully shy and I know that is hard to believe) I just opened the book and got Dale to calm me down. There’s also The Quick and Easy Way To Effective Speaking. And do you know who told me about that? My mother. One down. 98 to go. Thanks Mom. I still miss you everyday.